Have you always wanted to play the drums, but haven’t taken the plunge yet because of concerns about noise, setup space, or cost? If so, you should really reconsider—the recently released Roland TD-1K makes getting into drumming practical, cost-effective, and most of all, fun. As the new entry-level member of the mighty V-Drums lineup, this kit punches well above its price tag to put aspiring drummers of every age behind a serious instrument that will last through years of playing. Want to know more? Consider these five great reasons why the TD-1K is the very best choice to get you started with drumming. While very affordable at under $500 street price, you can rest assured that the Roland TD-1K is a drum set worthy of the respected V-Drums name. You might find less expensive electronic kits out there, but they won’t get close to the feel, sound, and stability of the TD-1K. It supports learning to play the right way, and features an open-ended design that makes it easy to upgrade with optional extras as you advance. Simply put, the TD-1K’s quality and features make practice sessions fun, which means you’ll play more often, improve faster, and quickly break into playing with other musicians. Quiet performance is essential for home drumming, and one of the big benefits that electronic kits have over standard acoustic drums. The Roland TD-1K delivers here, with low-noise pads/pedals and headphone monitoring that let you play for hours without bugging family members and neighbors. The practical, compact design fits into tight living spaces, and the sturdy drum rack can be adjusted with just three knobs, making it easy to set the drum positions right where you need them. Once you’re up and running, you can immediately get to the business of playing music, thanks to the sound module’s no-nonsense LED display and simple interface. When you’re just starting out, you might not be sure whether you want to play mellow jazz or thrash metal. Then again, maybe you want to do both! With the Roland TD-1K, you can keep your options wide open. There are 15 different drum kits to choose from, allowing you to completely change your sound with the touch of a button. Included are many types of acoustic drums, plus electronic kits for playing modern styles. From one instrument, you can channel a menacing modern crack for metal, a warm bottom-end thump for blues, or a chilly sci-fi click for drum ‘n’ bass. A flesh-and-blood drum teacher is a great way to help develop skills, but when you’ve got a week between lessons, you can still progress with the Roland TD-1K. Well known throughout the V-Drums line, the powerful Coach feature is also included in our entry-level kit, keeping you motivated with scored exercises that boost timing, accuracy, and feel. After you’re done with that and ready to do a little jamming, then check out the 15 onboard backing songs, which let you give it both barrels on a wide variety of music styles, from metal to acid jazz. You can also plug your smartphone or music player into the module’s Mix In jack and play along with all your favorite songs. Using the TD-1K’s built-in USB-MIDI interface, you can communicate with a world of music apps using a standard a USB cable. Roland’s free V-Drums Friend Jam applications provide jam tracks, practice features, and the ability to share your drumming progress with other V-Drums users around the world. The powerful DT-1 V-Drums Tutor is another perfect fit, offering a fun, dynamic user interface for learning notation and developing essential techniques. USB-MIDI also makes it possible to use the TD-1K to capture MIDI drum tracks while building songs in DAW recording software. What’s the Difference Between the TD-1K and TD-1KV? 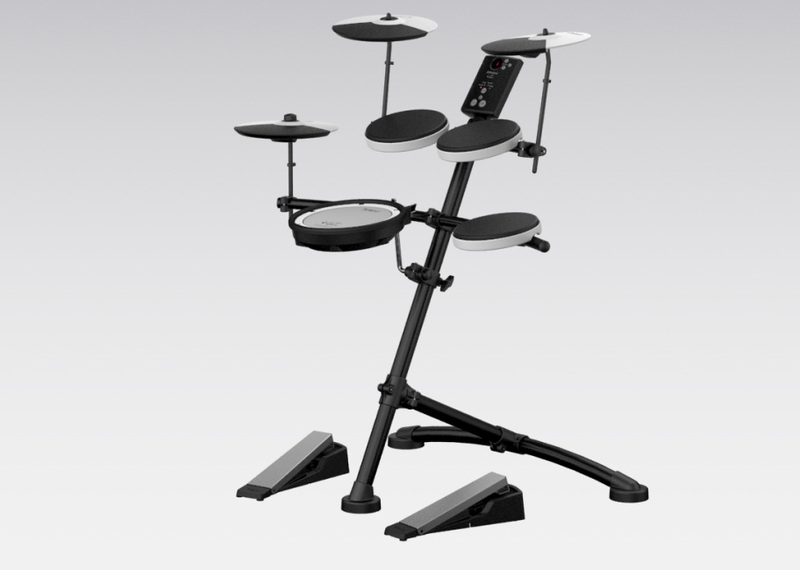 In this post, we’ve been talking specifically about the Roland TD-1K. However, all the points we’ve mentioned also apply to its sibling, the TD-1KV. It’s basically the same set as the TD-1K, with one difference: for a minimal extra cost, it swaps the standard snare pad for a mesh-head PDX-8. Mesh-head pads are used throughout Roland’s high-end V-Drums sets, and the PDX-8 provides a playing feel and response that’s even closer to an acoustic snare drum. In addition, the PDX-8 also supports rim triggering, which is an essential feature for playing more advanced snare drum techniques. So which kit do you choose? If you’re just starting out, either kit is great. On the other hand, if you’ve played a bit in the past and are just getting back into drumming, then you might want to step up to the TD-1KV. But don’t worry—if you go with the TD-1K now, you can always purchase a PDX-8 later and add it to your kit when you’re ready. The Roland TD-1KV V-Drums set includes a PDX-8 mesh-head snare pad.